There came a moment halfway through Deepsea Challenge 3D when I realized James Cameron's new film isn't really about exploring the depths of the ocean in the name of science. It's about James Cameron visiting the bottom of the ocean because James Cameron felt like it. Ostensibly, of course, the film, which is set for a nationwide release on August 8th, is about much more than that. 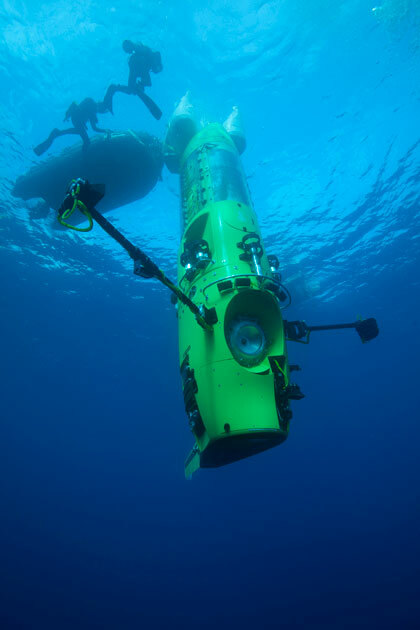 Backed by a team of scientists and engineers, Cameron spent seven years building a submersible capable of reaching the deepest point in the ocean, seven miles below sea level. Following a series of tests, many of them documented in this film, Cameron finally piloted the Deepsea Challenger into those depths, reaching the Mariana Trench in March 2012 and making him the first person to complete that journey since the Trieste touched down in 1960. This time, though, the vessel was kitted out with a couple 3D cameras, allowing Cameron to document the experience on video for the first time. (In fact, the documentary only features a few minutes of footage from the trench, but more on that later.) Basically, this film offers a first, if fleeting, look at the Earth's crust from 36,000 feet down under -- which means Cameron, the Academy Award-winning director, is as much an explorer here as he is a filmmaker. This film offers a first look at the Earth's crust from 36,000 feet down under -- which means Cameron, the Academy Award-winning director, is as much an explorer here as he is a filmmaker. And he never lets you forget it, either. By the time the first 45 minutes are up, we've seen clips from three of Cameron's films, including Titanic, Avatar and The Abyss, along with dramatized flashbacks to Cameron's childhood, when he dreamed of being the next Jacques Cousteau. (I can't make out everything I jotted down in that darkened theater, but I believe the word I used was "masturbatory.") Even interviews with Cameron's wife, Suzy Amis, feel like a bizarre kind of Cameron propaganda -- that's partly because audiences will recognize her as Rose's granddaughter from Titanic, and also because her main purpose is to vouch for how serious her husband is about deep-sea travel. To be fair, some of this was unavoidable. In producing The Abyss, the 1989 deep-ocean sci-fi film, Cameron consulted with various members of the deep-sea-diving community, including Don Walsh, one of the two men aboard that original 1960 voyage into the Mariana Trench. By the time Cameron began work on the Deepsea Challenger in 2005, he had already led seven deep-water expeditions, including three to the Titanic, and one to the wreck of the Bismarck, a World War II-era battleship that sank in the North Atlantic. The point is: Cameron isn't just another Richard Branson, a rich guy with time on his hands and a penchant for spaceships. The man has experience piloting remotely operated underwater vehicles, and sending him down 36,000 feet unaccompanied was not a stunt. He knows a thing or two about submersibles, not to mention 3D cameras and underwater lighting techniques. It's all a bit much, though. The film too often feels like an infomercial for James Cameron, sometimes at the expense of actual science talk. At one point, for instance, the film touches on underwater earthquakes, and how studying them might help us better prepare for the tsunamis they cause. We're then treated to a brief montage reminding us of the devastating 2011 tsunami that ravaged eastern Japan. It's thrilling to see a wall of water in 3D, but the moment quickly passes: Cameron moves on and never mentions the subject again. I'm no scientist, as you all know, so it's not my place to question Cameron's claim that this kind of exploration will one day aid tsunami research. But without much explanation as to why these expeditions are helpful, those clips of homes floating down the street come dangerously close to feeling like props. I can't make out everything I jotted down in that darkened theater, but I believe the word I used was "masturbatory." Meanwhile, we only find out in a postscript at the end of the film that Cameron's flagship voyage led to the discovery of 68 new species -- over 100 if you count the other dives. Not mentioned in the film: One shrimp-like amphipod produces a compound already used in clinical trials to treat Alzheimer's disease. And then there's my personal favorite: a see-through sea cucumber the size of a crayon (I mean, what?!). Those are just two of the life-forms managing to survive in the darkness at 36,000 feet below sea level. Seems kind of important, right? Or at least interesting enough for Cameron to discuss? And yet, it comes as an afterthought as the final credits are about to roll. Even then, you'd have to be reading the companion site to appreciate how fascinating this stuff is. Which is insane: If I were James Cameron, I would constantly be reminding you that I discovered a sea cucumber. 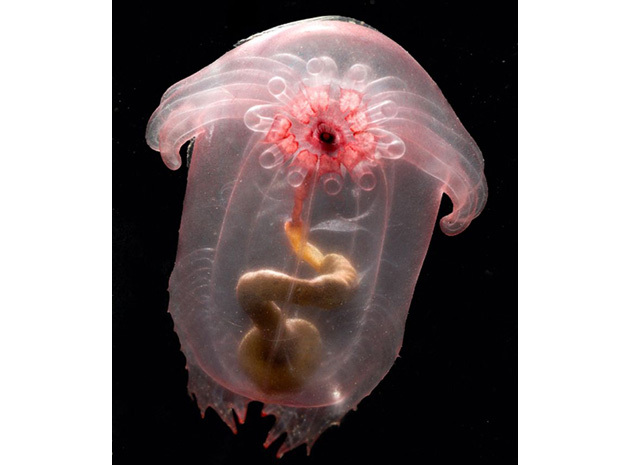 James Cameron is believed to have discovered a see-through sea cucumber, similar to the Enypniastes pictured here. Then there are the topics that don't get lip service at all. Is deep-sea mining a possibility? Will we ever see tourist expeditions, à la what Branson is proposing with Virgin Galactic? Did you know that the Mariana Trench has been proposed as a nuclear-waste dump? I did, but that's only because I read it on Wikipedia. After 90-some-odd minutes, the most sincere reason Cameron offers for his voyage is that he was able to satisfy his inner 9-year-old. Ironically, too, the final cut (it was directed by John Bruno, Andrew Wright, and Ray Quint) features very little footage from seven miles below. In movie-time, it takes about 10 minutes to get to the bottom of the ocean, at which point we spend little more than 10 minutes looking around. To be fair, there's not much to see. The terrain is "flat and featureless," to quote Cameron himself, with no animal tracks. Also, Cameron's stay was shorter than expected: He had intended to spend five hours down there, but left after three due to a series of mechanical failures. The film too often feels like an infomercial for James Cameron, sometimes at the expense of actual science talk. For that reason, then, the most rewarding parts of the film are the parts where we get to see Cameron and team testing the Deepsea Challenger in increasingly deep (and difficult) waters. One failed shallow-water attempt early in the film is particularly riveting, as is that final, eerily quiet descent into the deep. At one point, we hear a startling crack many feet underwater -- the sound of something possibly going very wrong. It made me wonder who would be crazy enough to test this gear, and it's fun to think that person is actually James Cameron. Much like Titanic itself, Deepsea Challenge 3D manages to be suspenseful, even though we know precisely how it's going to end. If only the final product weren't so shallow.